I'll bet there aren't too many people who have made a journey from the geysers of Iceland to Fenway Park in Boston. I went from 50 degrees and a cold rain in Reykjavik one day to a hot and humid 90 degrees in Boston the next. I picked a good day to make my first visit to Fenway Park. The A's won 8-1, behind some excellent pitching by Joe Blanton, some nice defense by Jay Payton and Mark Kotsay, some clutch hitting, and a boneheaded baserunning mistake by Manny Ramirez. The A's were ahead 5-1 in the sixth, when the Red Sox got a little rally going. 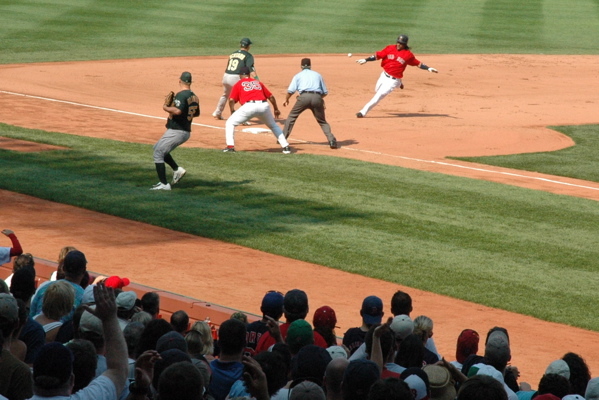 Down by four runs, Ramirez tried to go first to third on a single to center by Trot Nixon. Mark Kotsay is not a guy you want to challenge in that situation, and he nailed Ramirez at third, and killed the rally. With Joe Blanton was nailing the outside corner with his fastball all day long, and the umpire was consistently calling it a strike, that rally-killing baserunning mistake sucked all the drama out of the game. Which was fine with me, as it let me soak in the atmosphere of Fenway without biting my nails about the game. I had heard a lot about the ballpark, of course, so there weren't too many surprises. It was classically beautiful, as I expected. I suppose the biggest surprise to me was just how wholesome the atmosphere was. I suppose that might have been a function of the good seats I had, but I was expecting worse. The Red Sox fans who show up at the Oakland Coliseum are 1,000 times more obnoxious than the ones I encountered in Boston. The people were friendly and optimistic, even as their team was losing. There were lots of families with kids, one generation passing their love of baseball and the Red Sox on to the next. It was great to see. If there was any negative about the park, it was the PA system. The sound quality of the speakers was horrible, and they were way, way too loud. Between innings, it was utterly impossible to hold a conversation with the person right next to you because of the music being blasted in your ears. After nine innings of that sound system, I left the park with a pounding headache. Still, I'd happily do this again. It was a great time. Next time, though, I'll bring earplugs. I didn't get a lot of good pictures from the game, because half my view of the action was behind the screen, but I put up a a slideshow of my favorite pictures anyway. Pardon my ignorance, but why did you take the picture of the scoreboard? To show that the Red Sox were ahead? Or that even here, ads are on walls? Which picture are you referring to? The one with the caption "the picture that has to be taken?" If that's the one you mean, I took it because when you go to Fenway Park, you have to take a picture of the Green Monster, don't you? Otherwise, it would be like going to Paris and not taking a picture of the Eiffel Tower, or going to San Francisco, and not taking a picture of the Golden Gate Bridge. I've been to San Francisco several times and I've never taken a picture of the Golden Gate Bridge. FIE upon thee! That bridge is one of the most beautiful manmade-design objects on the planet. Even as a resident of the city I never tired of looking at it. I would consistently play one of the lamest golf courses on earth (Lincoln Park) in fact, for the 17th-hole view of the bridge. So lovely. I still can't escape the typos - BOB. I'm glad to hear the Fenway fans aren't obnoxious because, based on my experiences at the Coliseum, one could be forgiven for assuming that you have to be a total jerk to get through the turnstiles there. 2 Indeed, when one goes to Fenway, one needs to take pictures of the Green Monster. From my sole trip to Fenway, I took no less than half-a-dozen photos from every conceivable angle, making it the most documented wall in history. 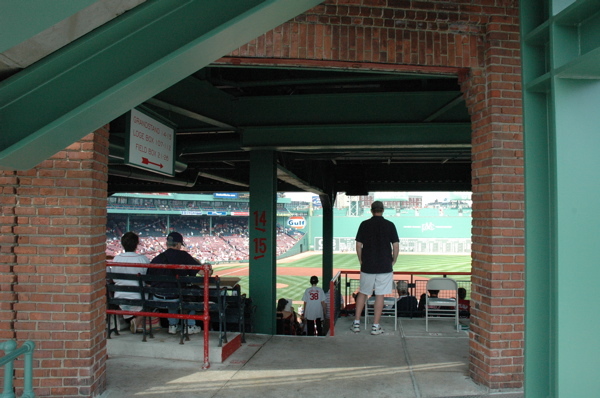 Like Ken, I enjoyed the atmosphere at Fenway on my trip there, though my one objection to the park is that the seats are not particularly kind to early 21st Century-sized humans. Contrast that to Wrigley, which I think has done a good job updating the seating without sacrificing the charm and tradition of the place. And unlike Ken, my experience at Fenway was not altogether wholesome, as one of the partisans in my section took umbrage that I would wear an A's cap to a Red Sox-Pirates game. I deftly escaped harm by using big words that frightened and confused him. As always, I enjoyed the photo gallery. I think I'm more of a Hayward Bridge kind of guy. Or maybe a Richmond-San Rafael Bridge type. Or maybe a Commodore Schuyler F. Heim Bridge. 8 You and Governor Arnold are the only two people in the state who would prefer a skyway to a cable-stayed bridge to replace the eastern portion of the Bay Bridge, I guess. 3 Me too. :) It's only because I despise that city though. Pardon me if this is too intrusive but I've been wanting to go to Iceland just for kicks. Where did you stay and for how long? Was it terribly expensive? Which bridge is it that you go over on the way into SF on 101 from the north? It's a half-circle style bridge, not a flat suspension variety. Can't be more than 10-20 miles north of the city. I've been over it two or three times, and my usually somnolent vertigo kicks in every time. 11 You're probably thinking of the Richmond-San Rafael Bridge. 10 Iceland is terribly expensive, yes. We stayed at the Floki Inn, which is more of a guesthouse than a hotel; it's not modern; you have a sink in your room, but no toilet or shower; those are shared down the hall. For that completely no-frills experience, we paid $150/night. The staff, which consisted almost entirely of foreign college students, was quite nice and helpful. We flew in on Wednesday and left on Friday. I think we did a pretty good job of sampling the best Icelandic tourist spots. We spent Wednesday evening and Thursday morning wandering around Reykavik. Thursday afternoon, we took the "Golden Circle" bus tour, which hit the most interesting natural formations near Reykjavik. On Friday, we stopped at the "Blue Lagoon" on our way to the airport, for a soak in their mineral-rich hot spring waters. If you don't mind, could you tell us anything else about your Iceland adventure, or if you have any recommendations. I'm going to Iceland in about a week and a half, and will be staying for a week. Do you have any tips or suggestions? I definitely plan on going to Blue Lagoon and Golden Circle at least, but I didn't know if you found maybe something else out that wouldn't be obvious and that a tourist should check out. I was only there for three days and two nights, so what I wrote above is about all I had time to do. If I had had more time, I would have liked to go check out some glaciers and stuff, but they're a little further away from Reykavik, so that wouldn't fit my timetable. If you're into animals, there's the puffin island and the icelandic horses and whale watching, but animals ain't my thing. Did you bump into Tom Hanks or Ron Howard?